This section contains information about some of the World War II tanks featured on Tankzone. 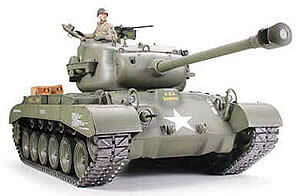 Our aim is to build it up over time to be a useful reference source for tank enthusiasts. Armament: One 75mm M3 main gun, one .3in M1919A4 machine-gun co-axial with main gun, one .3in M1919A4 machine-gun ball mount in hull front, one .5in machine-gun on turret roof, one 2in M3 smoke mortat in turret roof. Armour: Minimum: 0.6in (15mm), Maximum: 3.94in (100mm). Performance: Road speed: 26mph (42km/h), Road Range: 100 miles (160km), Vertical obstacle: 2ft (0.61m), Trench: 7ft 6in (2.29m), Fording depth: 3ft (0.91m), Gradient: 60 degrees. Powerplant: Ford GAA V-8 water-cooled petrol engine developing 500bhp at 2,600rpm. Dimension: Length: 20ft 7in (6.27m), Width: 8ft 11in (2.67m), Height: 11ft 1in (3.37m). Brief History Entered service in 1942 and saw extensive service with US Army and most Allied armies during and after World War II. 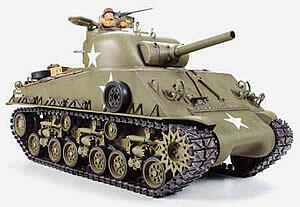 The M4 Sherman was the most prolific medium tank of World War II and saw action in the Korean and Middle East wars. The M4 Sherman had many deficiencies compared to the Panther being out-guned and out-armoured but it made up for these shortcomings in reliability, endurance and sheer weight of numbers. Nearly 50,000 in total were produced. The M4 proved a very versatile chasis and many variants were built most notable of which were the specialist tanks designed for the D-Day landing. Armament: One 90mm M3 main gun, one .3in M1919A4 machine-gun co-axial with main gun, one .3in M1919A4 machine-gun ball mount in hull front, one .5in machine-gun on turret roof. Armour: Minimum: 0.51in (13mm), Maximum: 4in (102mm). Performance: Road speed: 30mph (48km/h), Road Range: 100 miles (160km), Vertical obstacle: 3ft 10in (1.17m), Trench: 8ft (2.44m), Fording depth: 4ft (1.22m), Gradient: 60 degrees. Powerplant: Ford GAF V-8 water-cooled petrol engine developing 500bhp at 2,600rpm. Dimension: Length: 28ft 5in (8.65m), Width: 11ft 6in (3.51m), Height: 9ft 1in (2.78m). Brief History The Pershing entered US service late in 1945 towards the end of the second World War. It was one of the few Allied tanks to take on the German Tigers and King Tigers on equal terms. The M26 Pershing also served with the U.N. in the Korean War.